sent out an email to “motivate” his officers proposing a “friendly competition” to see who could kidnap the most people within the month of October. The winner was to receive a weekend off in November as a bounty. Somehow encouraging cops within their city to find any excuse they could to pad their arrest numbers didn’t sit well with the citizens of Abington. Although the competition is supposed to be voluntary, according to Chief Majenski, it raised obvious questions about the effect it might have on the perceived objectivity of police officers and the fact that it created a de facto quota system. “They are supposed to be neutral and independent when they are investigating potential criminal wrongdoing,”[defense attorney Joseph] Krowski said. The “friendly competition” could also impact something else; the criminal cases that resulted from those arrests. “It shows a motive, motive and bias against the defendant. A lack of neutrality,” Krowski said. Majenski must not have realized this or doesn’t comprehend the legal issues this brings. Nevertheless, this shouldn’t be a breaking realization to us because all police have a motive and bias against people. This one was just clearly written on paper (or via email). We all know that a police officer would lose their job if they didn’t write any tickets at all. Nobody knows the number of tickets police officers have to write to keep their jobs but we know what cops will do if told, or incentivized, to write more. They. Write. More. Also, cops know the system they work in, what happens if the resources aren’t used, or justified, and how that ties in with arrest, court time and the jail apparatus. 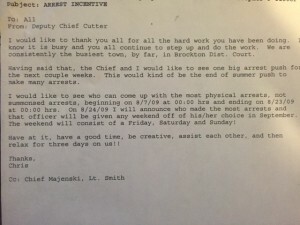 Majenski wasn’t doing anything special he was just being more upfront about it than any other departments. Government monopolized protection comes with a built in contest, because the funds aren’t derived from the customer but by politicians of the government, and it’s a major reason for the discourse between police (service providers) and people (customers) today. Police today have to impress, convince and play political ball in order to get their funding. Where if protection services were offered directly to the customer all the “police” would have to do is provide the service they promised, as promised. Instead of making more arrest to get a bigger budget they would try to provide the best and most effective services to get the most customers. 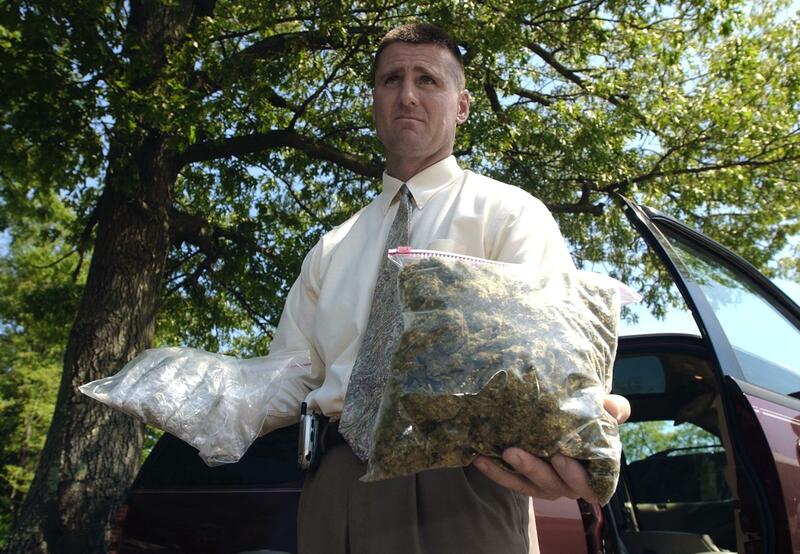 So while Majenski is most likely going to get fired – he’s also in some lawsuits people are starting to talk about – as a result of these ‘friendly competitions’ remember, every single police officer is out there looking to make their next arrest. Contest or not.